President Maithripala Sirisena, displaying his determination to prevent any chances of bridging the gap between him and UNP, appointed a Presidential Commission of Inquiry to investigate into the Acts of Corruption and Frauds that have been allegedly committed in State institutions during the period from 15 January 2015 to 31 December 2018. The Gazette notification in this regard was issued as President Sirisena was on a State visit to the Philippines. The responsibility of this Presidential Commission is to summon public complaints, information and other details and to swiftly conduct an impartial and comprehensive investigation into allegations against individuals who held or remain in political positions as well as against the public servants and officers of the statutory boards, who held or remain in those positions, regarding serious losses or damage caused to State assets and revenue as a result of the acts of corruption, frauds and criminal breach of trust, criminal misappropriation of property, cheating and abuse of power or authority, State resources and privileges, committed by those individuals during this period at the State institutions. Retired Supreme Court Judge Upali Abeyratne was appointed as the Chairman of this Presidential Commission and other members are retired High Court Judge Sarojani Kusala Weerawardhana, retired Auditor General Pasdun Korale Arachchige Premathilake, retired Ministry Secretary Lalith R. De Silva and retired Deputy Inspector General of Police M.K.D. Wijaya Amarasighe. Instructions have been given to handover the first report within three months and the final report consisting of conclusions and illustrations should be submitted to President Sirisena, within six months. President Sirisena met the President of the Philippines, Rodrigo Duterte, on Wednesday (16) at the Malacañang Palace. Five Memorandums of Understanding (MoUs) were signed during bi-lateral discussions between the two countries’ delegations. The Sri Lankan delegation signed agreements pertaining to fields such as security, tourism, agriculture and education. The two nations had also exchanged ideas on the setting up of a new economic council to further solidify social and economic relations between Colombo and Manila. President Sirisena left for the Philippines on the morning of 15 January, for a five-day State visit at the invitation of the Philippines President. During his visit to the Philippines, the President is expected to further strengthen political, economic and cultural ties between the two countries. 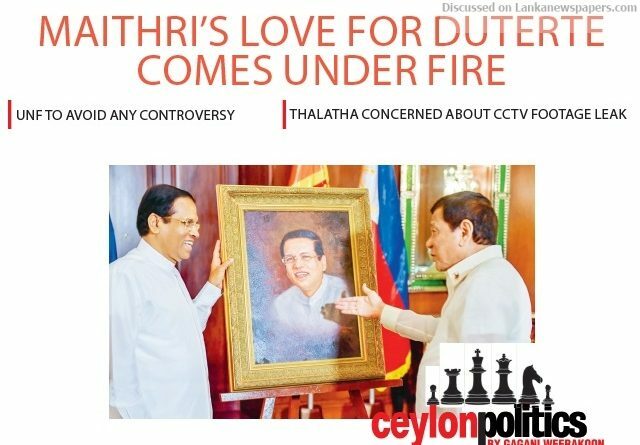 President Sirisena who vowed last year to “replicate the success” of the Philippines’ drug war heaped praises on President Rodrigo Duterte’s crusade again, saying it is an example to the whole world. In his toast during a State banquet in Malacañang, Sirisena said that Duterte’s drug war is also a personal example to him. “The war against crime and drugs carried out by you is an example to the whole world and to me personally. Drug menace is rampant in my country and I feel that we should follow your footsteps to control this hazard,” he said. Duterte’s war on drugs has drawn global condemnation for the mounting deaths linked to it. Official Police data put the death toll from drug operations at a little over 5,000, but Human Rights groups say this figure is significantly lower than the actual number of killings. As expected, Human Rights groups have expressed alarm at President Maithripala Sirisena for praising Philippine President Rodrigo Duterte and his ‘bloody war’ on drugs as an “example to the whole world”, Reuters said today. Despite international condemnation of a crackdown that has killed thousands of Filipinos, visiting Sri Lankan President Sirisena told Duterte during a banquet this week that he wanted to “follow your footsteps to control this hazard”. “No ‘drug war’ that treated the drug problem purely from a crime perspective has ever succeeded. What they have wrought are untold suffering and the further destruction of the rule of law and the diminution of human rights,” he said. The Philippines Government has consistently refuted that and said the crackdown, which started in July 2016, was being administered lawfully. Philippines Human Rights group, iDefend, said that if Sirisena was serious about following Duterte’s lead, he should be ready to face scrutiny by the International Criminal Court (ICC) in the Hague, which has started a preliminary examination into alleged crimes against humanity by Duterte. “We warn Asian leaders not to emulate the Philippine model but adopt a humane, evidence-based public health approach to the drugs issue through a rights-based governance that strengthens, not erodes democratic institutions,” iDefend spokesman Judy Pasimio has told Reuters. It is in the midst of this that CCTV footages of prison inmates at Angunakolapelessa Prison being harassed get released to the Media and the public adding fuel to Sri Lanka’s already tainted human rights record. Leaked CCTV footage from the Angunakolapelessa Prison revealed that on 22 November 2018, Prison Police personnel, led by the Prison Superintendent, chased unarmed and unresisting prisoners in remand custody, got them to crawl and walk on their knees, continuously attacked and assaulted them with batons and in one instance, even kicked a detainee. The Committee for Protecting the Rights of Prisoners (CPRP) lodged a complaint with the Prisons Commissioner General, the Human Rights Commission and the Justice and Prison Reforms Ministry, over the alleged assault. Previously, on 15 January, the CPRP lodged a complaint with the Criminal Investigation Department with CCTV camera footage- based evidence of the aforementioned incidents (warning also of the likelihood of the CCTV evidence being deleted and erased). The video taken from the newly established Prison which the Government has described as the super Prison, the most luxurious of the country’s institutionalized correctional facilities found within the rehabilitation based penal system, shows Prison personnel (a minimum of 25 to 30) led by the Prison Superintendent, the latter dressed in civvies, chasing unarmed and unresisting (with no provocation too) remand prisoners, who were only moments ago asleep and clutching their bed sheets, blankets, pillows and sarongs, into an open yard in one corner of the prison fortified from outside of the high barb-wired Prison wall by a guarded watchtower. The remand prisoners are then attacked and assaulted with batons with the Prison Superintendent also dealing blows and clubbing them. The officers then get the detainees to kneel with their hands held high above their heads and to move forward on the gravelly and sandy path on their knees and to even crawl on all fours, all the while continuing to beat them on the soles of their feet, upper (necks, shoulders) and lower backs, hands, and the frontal upper torso. Minister of Justice and Prison Reforms Thalatha Atukorale on the Government’s position on the incident regarding the assault of prisoners at the Angunakolapelessa Prison expressed regret if mental hurt was caused to the families and relatives of the detainees (according to the Minister also including convicts and those who have filed appeals) who were assaulted. Apart from the three-member committee, (comprising two Prisons Department officers, and a representative of the Ministry) that is presently conducting an inquiry at the Prison and whose report is expected before 21 January, a second committee (comprising a Ministry representative, a representative from the Presidential Secretariat, and a representative from the Ministry of Public Administration) has been appointed, whose report is expected by 25 January. Further, while the entire prison is covered by closed circuit television (CCTV) cameras, the room from which the CCTV camera security system is operated has been sealed, the Minister added. She further said how the CCTV footage with regard to the incident was leaked to the media would also be looked into and disciplinary action would be taken against those responsible. She opined that the confidential footage should have been brought to her or the Justice and Prison Reforms Ministry Secretary’s notice prior to being given to the media in the event, no action was taken by the relevant authorities. She observed that based on the reports, not only would she take action sans regard for position and status, but added that if such incidents recur, she would even resort to changes within the Prisons Department top brass in order to restore normalcy. Speaking at length about the sequence of events leading up to the incident on 22 November 2018, she rejected the claim that on 21 October a protest had occurred at the Prison because detainees being brought back to the Prison after being produced in Courts and prisoners’ visitors had been strip searched, describing it as untruthful. Explaining further about the claims made about the Special Task Force (STF) searches, she added that on the contrary, the searches were conducted in a disciplined, decent manner. “In fact, if we are to find out how certain detainees smuggle drugs into the Prison, we would have to do more than strip searches. Therefore, to this end, we have purchased new equipment in the short run. Angunakolapelessa was placed by me under complete STF protection. But they can’t go inside the Prison. They are only stationed at places where detainees and visitors are searched. Male STF personnel search males while women STF personnel search women. In the lead up to the events on 22 November, Minister Atukorale said that on 14 November, a suspect (for allegedly abducting an underage girl) produced at the Embilipitiya Magistrate’s Court, who attempted to jump off the Court roof and escape, had been arrested while on 16 November, a convict who received the death sentence for his part in the infamous 1999 Hokandara murder case, was beaten to death with a rock (so that the brain matter had spilled out) by two murder convicts including one who received the death sentence for his part in the Rita John murder case and on 20 November, a suspect had consumed a cleaning chemical and attempted to escape when produced before the Prison Hospital doctor. She also noted that Courts had previously warned the Prison officers over delays in producing detainees in Courts, delays which she attributed were done purposefully by the detainees in order to inconvenience the Prison officers. The CPRP on Friday (18) said they would raise the case of the assault of detainees by Prison officers at the Angunakolapelessa Prison on 22 November 2018 at the United Nations (UN) Human Rights Council sessions in Geneva, Switzerland in March. The CPRP lodged a complaint in this regard at the Human Rights Commission of Sri Lanka (HRCSL). The CPRP will also lodge complaints with the UN in Sri Lanka and the National Authority for the Protection of Victims of Crime and Witnesses. By last week, two of Rajapaksa brothers declared their willingness to contest the next Presidential Election. Former Defence Secretary Gotabaya Rajapaksa who said he is ready to contest believes that the US could block individual rights as far as the matter of dual-citizenship was concerned as it is something personal. He said he could either cancel or keep the dual-citizenship as it was something personal. Meanwhile, Hambantota District UPFA MP Chamal Rajapaksa speaking to the media said that he too is ready for the forthcoming Presidential Election. He said further that Gotabaya Rajapaksa says that if the people are ready, he is also ready to contest for the Presidential poll. If I am also suitable for the post of President, I am also ready for it. However, United People’s Freedom Alliance (UPFA) Parliamentarian S. B. Dissanayake said picking the presidential candidate is never a priority, forming a strong political front to fight the United National Party (UNP) should be the current priority. “Given the unpredictable political context, it is impossible make an exact prediction of who will contest the upcoming presidential election, so, let the leaders like our President Maithripala Sirisena and former President Mahinda Rajapaksa decide that. We have two people who contested the presidential election and won, they are experienced leaders, and they know how to navigate us towards 2019 presidential election,” he said. He said parties such as Sri Lanka Freedom Party (SLFP), Sri Lanka Podujana Peramuna (SLPP), Communist Party of Sri Lanka, Pivithuru Hela Urumaya (PHU), National Freedom Front and Democratic Left Front should make a strong alliance because UNP is infamous for election fraud. “It will take time to create a strong front; we have time. No presidential candidate has been picked yet. Some say that it will be current President Maithripala Sirisena but our President has not announced such a thing so far,” added Dissanayake. Meanwhile, the Prime Minister Ranil Wickremesinghe-led UNF Government appears to have taken a precautionary measure to avoid approving any Cabinet paper or taking any drastic decisions that could end in ‘controversies’ during this year. He was responding to a journalist’s query on the ‘crucial meeting’ he had with former Sri Lankan skipper Kumar Sangakkara on a health-related project proposed by the latter. It was said that the meeting between the two went for almost two hours, but the Minister denied this saying it went for little over 10 minutes. “I told him in a discussion that such a project would need Cabinet approval. But this isn’t the time for such decisions. Because we won’t be taking any controversial decisions during this period as this year is an election year. So, I told him that we can do the project when we form our next Government after the Elections,” he added. He added that unlike before, he and President Maithripala Sirisena are in two different political camps. “There are certain political differences between me and the President. Both of us came from the same side, but now I am on one side, whilst he is on another side. But I will give good competition from my own side without any fear or doubt. When the President asked me about this decision to bat for different sides, I clearly told him that because he is now with Pohottuwa camp which tries to create factions in the camp where I am, I will also give my full strength to break and defeat his camp,” he added.